Become famous together with myDaVinci's In-Masterpiece series of artworks. 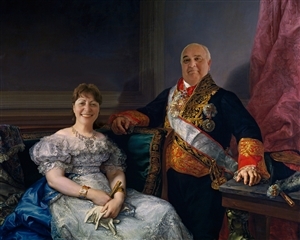 Based on your photo(s), our talented graphic artists will seamlessly place the couple into this timeless masterpiece entitled "Antonio Ugarte and his wife, Maria Antonia Larrazabal", originally created by Vicente Lopez Portana in 1833! Let this personalized piece of art show their everlasting love on the wall. Delivered on time, looks great, well done.